In the Skouries region of Chalkidiki, Northern Greece, Canadian company Eldorado Gold obtained mining rights for the Kakkavos Mountain gold through its Greek subsidiary, Hellenic Gold, after a controversial transfer process in 2004. Local residents have been opposed to the company owing the mining rights during the last decade. Ierissos city feels like a police state, and many suspicious events are taking place. The surrounding forest, which will be destroyed as per 0.4% (according to the company's research), is one of the rarest European primordial forests; moreover there is likely to be significant danger to the health of nearby residents. The company's environmental impact report is deficient [el], according to Aristotle University of Thessaloniki. The mining rights purchase was orchestrated with the assistance of Greek politicians, some of whom have recently been involved in corruption scandals. Among them are Christos Pachtas [el], the former Deputy Minister of National Economy and now the Mayor of Aristotelis Municipality, and George Papakonstantinou, the former Minister of Finance and Minister of Environment. Greek media magnate George Bobolas also played a key role through his construction company, AKTOR. Recently, Hellenic Gold has increased mining activity due to a price hike for the precious mineral, and the resistance by local residents has grown even stronger. The case has grown big nationally and public opinion sides with locals. The same is true in the Greek twittersphere under the hashtag #skouries. 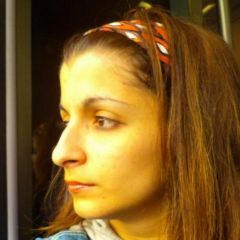 @ypopto_mousi: Μην εξοργίζεστε. Η λάσπη και τα “ρεπορταζ” για τις #skouries είναι μέρος αμυντικής στρατηγικής.Τώρα ακολουθούν την ατζέντα δεν την φτιάχνουν. @ypopto_mousi: Don't become exasperated. Mudslinging and the “reports” on #skouries are part of a defensive strategy. Now, they follow the agenda, they don't make it. 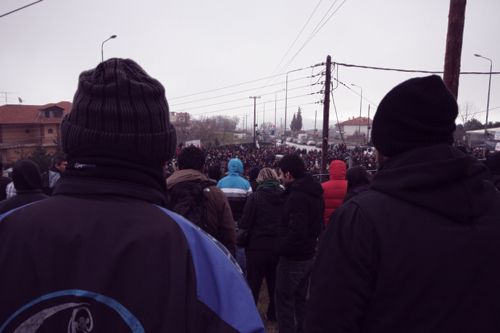 Tensions culminated on Saturday, February 17, when a group of 40 masked people attacked the Skouries gold mine site with molotov cocktails, damaging machinery, containers and vehicles. According to the police, the culprits had left the scene by the time they arrived. The following videos, leaked by security guards to the media, show what happened. The videos were edited by the news portal Enikos.gr. These police tactics have earned intense criticism by citizens and legal experts as a flagrant violation of human rights. Taking DNA samples is not legal without charges. According to the Hellenic Mining Watch blog, which plays a key role in activism and updates on the case, the situation is spinning out of control [el]. In an interview in Thessaloniki [el] on Friday, February 22, seven lawyers talked of the “constitutional aberration” in Skouries, referring to the incidents of the previous week. While all this happened in Chalkidiki, numerous mainstream Greek media followed a special defensive line in favor of the company. This came as no surprise since Hellenic Gold spends big money on media advertising for positive publicity on its investment. 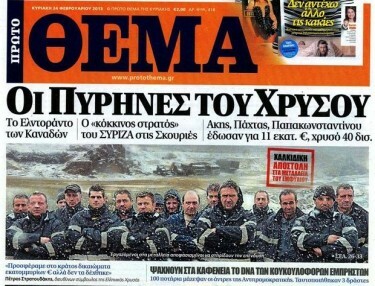 A chief example is a publication by popular newspaper Proto Thema (First Issue), which correlates the actions in Chalkidiki with terrorism. The residents didn't give up. On Sunday, a peaceful demonstration against the gold mines took place in Megali Panagia, one of the closest villages near Kakkavos Mountain, organized by thousands of local residents, groups, and parties supporting the villagers’ struggle. Police entered our houses aggresively and with no respect. The day before yesterday, the prosecutor came in for my detention; as a result my child was scared. communities formed in Twitter are able to operate autonomously across the news spectrum, from the production of primary news update till fact-checking and news dissemination without any journalist's participation. Tension continues to reign in the area. Given the severity of the situation, we will return to the case, should more news emerge. Spanish group Todos somos griegos (We are all Greeks) made a Storify collection of Greek and other multilingual tweets about the recent events in Skouries. Global Voices author Asteris Masouras also made a Storify collection of these troubled two days’ tweets and contributed to the creation of this article. RANDOM. Break the code. Break the culture.